Creative BioMart Mammalian Two-Hybrid Assay allows rapid and convenient analysis of protein-protein interactions in transfected mammalian cells. This assay uses a SEAP secreted reporter to measure the interactions between the two proteins of interest, eliminating the need for cell lysis. 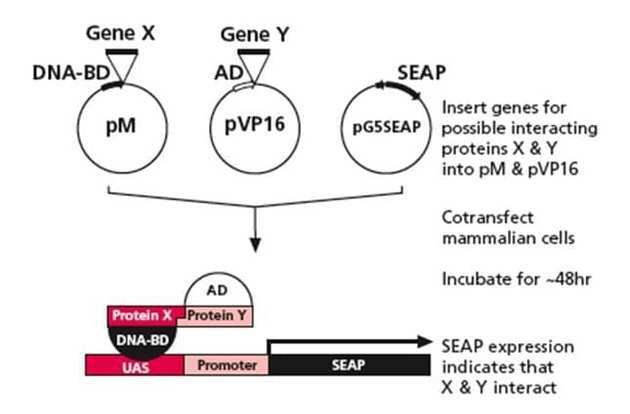 Because this two-hybrid assay is performed in mammalian cells, proteins encoded by mammalian cDNAs are more likely to be in their native conformation; therefore, post-translational modifications and experimental results are more likely to represent biologically significant interactions. A major advantage of the mammalian two-hybrid assay over yeast two-hybrid system is that protein-protein interactions are studied in mammalian cell lines. 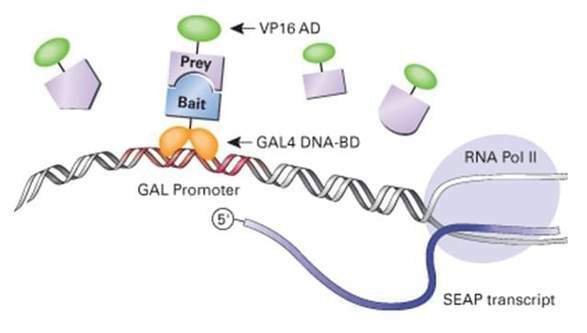 As a result, this assay enables researchers to study interactions between mammalian proteins that may not fold correctly in yeast or that require post-translational modification or external stimulation that is not present in yeast. We will be glad to discuss details of intended interaction studies with you and develop experimental strategies/methods tailored to your requirement. Please get in contact with Creative BioMart for more information or a detailed discussion.